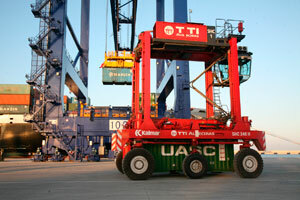 Total Terminal International Algeciras, a container terminal operator of Hanjin in Southern Spain, has gone live with a new real time locating system from IDENTEC SOLUTIONS for the tracking and control of containers. Leveraging IDENTEC SOLUTIONS’ SensorSMART Technology Platform, it combines active RFID tags along with a real-time positioning and visibility system that determines the exact location of shuttle vehicles under eight ship-to-shore cranes. As shuttles discharge or pick-up containers, the shuttle ID and position are determined in real time and then matched to the container ID captured by the Hi-Tech optical character recognition system mounted on the cranes. Based on the ISO 24730-5 standard, this solution ensures increased traceability, ship-to-shore productivity and provides a safer work environment. The terminal, owned and built by the South Korean Hanjin Group and located at the Port of Algeciras on the Strait of Gibraltar, is designed to accommodate 1.6 million twenty-foot equivalent units, a measure used for capacity in container transportation.